There are a lot of moments throughout a day when one is looking for the perfect equilibrium and would like to bring some peace into his life. But not always the classical water packaging is satisfying our needs: the 2 liters bottle is not too easy to handle and the 0,5 liters bottle is to little if we are very thirsty. Thus, MullenLowe identified some key-situations when the ZIZIN 1 Liter bottle could bring the peace better than any option: while training at the gym, while working at the office and while driving into the traffic. “ZIZIN has been sharing the peace since 2014 and we have decided to keep communicating into the equilibrium territory after receiving a positive feed-back from our consumers. The new campaign highlights the perfect balance of the new 1 liter bottle. We know that ZIZIN 1 Liter is still mineral water with neutral pH that helps us to find the equilibrium and get over the small daily challenges, but more than that it provides us the exact quantity of water that we need in some specific situations”, says Erhard Lorenz, Marketing Director, ZIZIN. The TV commercial will be aired between April 21st and May 29th. “In order to keep your inner peace in the everyday rush, you must always have at your hand a water bottle specially designed to fit in any situation and to satisfy your hydrating needs. And ZIZIN 1 liter is neither too big to carry it, nor too little to finish when you are still thirsty. As it can be seen in the 30” commercial: is the ideal packaging for three of the most common situations (gym, office, traffic). And as it has been said in the slogan: neither too much, nor too little…exactly as it’s needed!” says Andrei Munteanu, Group Creative Director MullenLowe. The communication mix is completed in a perfect harmony by: radio, POSM and online. 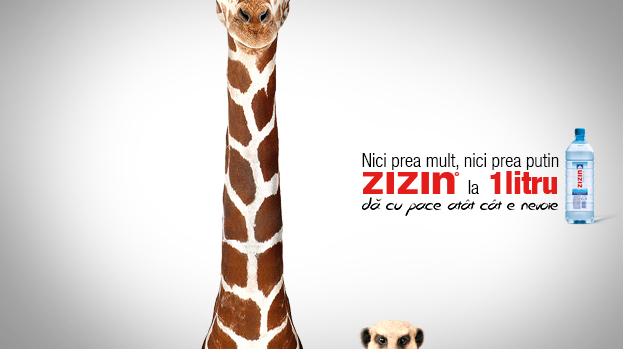 The ZIZIN team which is sharing the peace with this new campaign is formed by: Laura Lazăr (Chief Executive Officer), Laurențiu Lazăr (Board President), Erhard Lorenz (Marketing Client Service Director), Georgiana Bogdan (Marketing & PR Specialist) and Mihai Pârvulescu (Marketing Specialist). The pace-makers from MullenLowe are: Vasile Alboiu (Chief Creative Officer), Victor Oprișan (Group Creative Director), Andrei Munteanu (Group Creative Director), Ilinca Nanoveanu (A/V Manager), Alina Bălan (Client Service Director) and Andra Panaitescu (Account Manager).